PAWTUCKET, R.I., Apr 26, 2010 (BUSINESS WIRE) –Hasbro, Inc. (NYSE: HAS) welcomes warm weather fun with innovative new toys and games for families around the globe. With its rich portfolio of world class brands like NERF and MONOPOLY, and licenses for IRON MAN 2 and TOY STORY 3, Hasbro continues to deliver memorable play experiences for a wide variety of audiences. In addition to entertainment based toys and games, exciting new products include the introduction of Hasbro’s U-BUILD line of customizable board games based on its classic brands including MONOPOLY, CONNECT 4 and BATTLESHIP. And, for kids looking to cool down while getting active this summer, Hasbro combined two of its powerhouse brands to create the new NERF SUPER SOAKER line of water blasters for the ultimate experience in warm weather water battles. Click the headline of the story to read the rest of the press release. PAWTUCKET, R.I., Apr 26, 2010 (BUSINESS WIRE) --Hasbro, Inc. (NYSE: HAS) welcomes warm weather fun with innovative new toys and games for families around the globe. With its rich portfolio of world class brands like NERF and MONOPOLY, and licenses for IRON MAN 2 and TOY STORY 3, Hasbro continues to deliver memorable play experiences for a wide variety of audiences. In addition to entertainment based toys and games, exciting new products include the introduction of Hasbro's U-BUILD line of customizable board games based on its classic brands including MONOPOLY, CONNECT 4 and BATTLESHIP. And, for kids looking to cool down while getting active this summer, Hasbro combined two of its powerhouse brands to create the new NERF SUPER SOAKER line of water blasters for the ultimate experience in warm weather water battles. "Hasbro is proud to offer a wonderful selection of innovative, new toys and games this spring and summer from brands that children and their families know and trust," said John Frascotti, Global Chief Marketing Officer. "We're providing consumers around the world with highly immersive and fun play experiences, and we're delivering these at a compelling value. We believe that our iconic line-up, including MONOPOLY, NERF, LITTLEST PET SHOP, MY LITTLE PONY, FURREAL FRIENDS, PLAY-DOH, and IRON MAN -- to name just a few -- will provide kids and their families with truly memorable experiences this spring and summer." 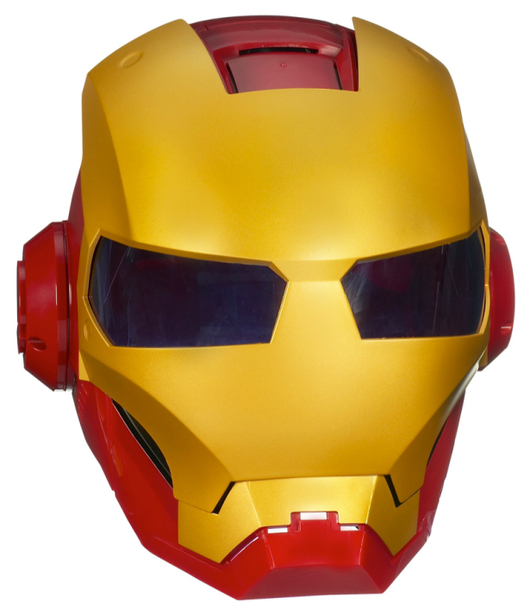 In 2010, kids can slip on the IRON MAN 2 IRON MAN HELMET to hide their identity from their evil adversaries. 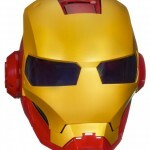 The helmet is designed in IRON MAN's signature style and features a variety of electronic lights and sounds, including data correspondence from JARVIS, his trusty computer companion. Fans will especially enjoy the helmet's slow release visor that lends remarkable authenticity to this fun role-play toy. As fans know, TONY STARK's armored suit's technology hinges on drawing its power from the one-of-a-kind arc reactor in his chest. Now, all kids can pretend to draw their IRON MAN role-playing energy from the light-up IRON MAN 2 ARC CHEST LIGHT, which features power-up sounds and easily clips onto shirts. IRON MAN 2 3 �" MOVIE ACTION FIGURES. In 2010, the line will include 17 IRON MAN action figures, as well as five supporting characters and villains. And not only do the figures feature excellent articulation, they also include a display stand and collectible "Armor Cards." Each set of cards displays different parts of an IRON MAN suit - by overlaying the cards on each other, fans can create more than 46 different suits of armor! Activate the SPACE SHOOTER and target the enemy toys! See how it feels to be Buzz Lightyear as you collect tokens and earn points by blasting rival toys with Buzz's authentic Space Ranger foam disc blaster. Help protect the toys and bring them to safety with the TOY STORY 3SPACE SHOOTER GAME. Bring Buzz Lightyear back to full flying speed by removing all 13 of his malfunctioning parts without touching the sides of his spacesuit and setting off the laser sounds. Extract Buzz's Toasted Turbo Booster, Crystalic Confusion or Battered Blaster and earn the most money to win the game. As part of the brand's 75th anniversary celebration, MONOPOLY is giving players the chance to choose how long they want to enjoy a game with MONOPOLY U-BUILD, a new concept in MONOPOLY game play. Using hexagonal property spaces that snap together, players build a game track that creates a custom game board and determines the length of play. Decide to use the Starter Track for a 30-minute game before dinner, or try the Classic Track for a 60-minute game during family game night for longer-lasting fun. Once you've perfected these tracks, move onto the Pro or Freestyle Tracks for the ultimate gaming challenge. In MONOPOLY U-BUILD you choose, you build, you play! U-BUILD CONNECT 4 combines the family favorite of CONNECT 4 with customizable U-BUILD bricks that create a unique game experience every time the game is played. Start by building a grid using U-BUILD bricks that snap into the game unit. Once the grid is built, players drop their red and yellow checkers into the top of the game and watch as the checker bounces down into a row. Add U-BUILD bumper arms to the top of the grid to help to steer a checker into a chosen row in your attempt to get four in a row. Bumper bricks can be used to assist a score or used as a defensive move to keep the opponent from scoring. Drop the checkers and see where they land - slide, bump and block your way to victory! Change your game with the U-BUILD BATTLESHIP Game! A new way to play the classic game of BATTLESHIP, in U-BUILD BATTLESHIP players can build and customize their fleet of ships, including Battleships, Aircraft Carriers, Destroyers, Submarines and PT Boats, and stack weapons on the ships to increase the power of their hits. Destruction is the name of the game as players work to blow their opponent's ships "out of the water" by firing shots across the battle zone, while keeping their ships hidden and safe. Sink all of the "enemy's" ships to win! The biggest blaster in the new collection, the NERF SUPER SOAKER SHOT BLAST water blaster can drench your opponents from up to 25 feet away. All you need is a single pump to unleash a huge blast of water to soak them! The customizable NERF SUPER SOAKER SHOT BLAST water blaster is compatible with the Tactical Rail System accessories (sold separately) and features adjustable and removable shoulder stock for maximum customization. Available in red or blue at most major toy retailers nationwide and on HasbroToyShop.com. Each sold separately. It's dinnertime for BABY ALIVE SIPS & CUDDLES doll! Girls can "feed" this snuggly, plush doll from the yellow bottle tethered to her arm and BABY ALIVE SIPS & CUDDLES will "slurp" it all up. She'll also respond to hugs from her "mommy" and "coo" like a "real" baby to show how delighted she is. BABY ALIVE SIPS & CUDDLES is machine washable and requires 2 AA batteries, included. Available at most major toy retailers nationwide and on HasbroToyShop.com. So cute and small, you'll want to adopt them all! FURREAL FRIENDS SNUGGIMALS palm-sized pets are a handful of fun. Pet the adorable SNUGGIMALS puppies on their backs and they'll move their heads and wag their tails, ready for playtime! SNUGGIMALS kitties love to have their tummies rubbed, and furry SNUGGIMALS bunnies are comfiest when they cuddle into your palm. When you stroke their backs, watch the cute SNUGGIMALS seals wiggle about in your hand. Little girls can choose from more than 20 different SNUGGIMALS pets, but it's more fun with more than one! Each pet is sold separately. Requires one "AA" battery, included. Available at most major toy retailers nationwide and on HasbroToyShop.com. Girls can join their favorite pets in the LITTLEST PET SHOP collection on a fun-filled road trip with the LITTLEST PET SHOP PAW POWERED CRUISER playset. The first-ever vehicle in the LITTLEST PET SHOP line features seating for six pets including a working swing and "real" spinning hamster wheel. Pets can even enjoy the 360-degree view from the top of the vehicle as they ride in the adorable rotating basket. The LITTLEST PET SHOP PAW POWERED CRUISER includes an exclusive hamster pet. Available at most major toy retailers nationwide and on HasbroToyShop.com. Girls can join little PINKIE PIE and her mom for a fun-filled adventure with the MY LITTLE PONY FAMILY CONVERTIBLE vehicle. This colorful pink and purple car features blue and yellow embossed balloons and a comfy car seat for little PINKIE PIE to relax in and enjoy the ride. The FAMILY CONVERTIBLE comes with everything little PINKIE PIE and her mom will need for a full day "out on the town" including a grocery bag, lunch pail and travel "coffee cup." While supplies last, the playset comes complete with a 20 minute MY LITTLE PONY animated DVD. Available at most major toy retailers nationwide and on HasbroToyShop.com. STRAWBERRY SHORTCAKE is ready for fun in the sun with the STRAWBERRY SHORTCAKE SPLASHIN' PETAL POOL playset! Girls can fill the pool and whirlpool area with water and press down on the sunflower leaf for a real shower! Then, glide the STRAWBERRY SHORTCAKE doll down the pink waterslide for a fun ride into the pool. After a day of splashing around, dry off the sweet-smelling STRAWBERRY SHORTCAKE doll with her fabric towel and put on her beautiful sun bonnet so she can stay cool. Now STRAWBERRY SHORTCAKE is ready to relax under the removable umbrella, and there's plenty of room for her friends to join! Some assembly required. Available at most major toy retailers nationwide and on HasbroToyShop.com. Fifty years later and the PLAY-DOH FUN FACTORY is still a favorite! This updated version of the classic toy features a thick handle so little hands can easily press down on the extruder to create one of eight silly shapes. The extruding dial is now attached so that it cannot get lost- simply spin the dial to select a favorite shape! Set includes two 2-ounce cans of PLAY-DOH compound and a plastic cutting tool, which can all be stored in the FUN FACTORY base. Available at most major toy retailers nationwide and on HasbroToyShop.com. These adorable small scale friends from PLAYSKOOL are sure to charm toddlers with their bright smiling faces. The squeezable MINI WHEEL PALS animals are available in a Jungle, Arctic or Farm themed assortment of four charismatic pals, each assortment sold separately. Available at most major toy retailers nationwide and on HasbroToyShop.com. this still doesn't tell me when hulkbuster is coming out! For some reason, I really want that chest light thing. I saw some of those Nerf SuperSoakers the other day and was pretty tempted to pick up a couple to have some water gun wars. It's already hot as sh** where I live. @ludovicotek: Yea, I live in Broward. South FL is always insane this time of year.